It’s no surprise that the current craze in fitness is dance-inspired workouts. Throughout the years, the dancer’s graceful yet athletic body has been the epitome of strength and beauty. From aerobics to Pilates to Zumba, the trend always leads to the dancer’s aesthetic. And today’s take on dance-derived fitness includes ballet-inspired barre workouts, dance cardio jams, and other strengthening and lengthening classes to help you not only look, but also feel like a dancer. But these dance-based workouts are not just for non-dancers. In fact, these new fitness techniques are the perfect supplement to any dancer’s training. Whether you’re looking to build endurance, strengthen your core, or tone specific muscle groups, don’t be afraid to step outside the dance studio. What’s more, teaching this type of fitness is the perfect way for dancers to stay in shape, utilize their creative talents (choreographing routines, interacting with clients, exploring musicality, etc. ), and rejuvenate their bodies and minds. To convince you, Dance Informa interviewed four fitness instructors/professional dancers who credit their new cutting-edge techniques to their ever-blossoming dance careers. Malin Barr, an instructor for the dance-inspired fitness company Barre3. Photo courtesy of Malin Barr. “I’m originally from Sweden and started taking ballet lessons when I was five years old and competed in gymnastics, too. Because I loved dance, I started taking partnering, jitterbug and salsa, and continued to train in jazz, ballet and modern. At nineteen I moved for the first time to NYC to enroll at the ISVP program at Steps on Broadway. But 6 months later, I injured my knee and moved back to Sweden. After my injury healed, I continued training in dance and musical theatre in both Stockholm and London. Since I moved back to New York City, I would say I’ve grown strongest in jazz, contemporary, and house dancing. While I am currently focusing on acting and film, dance is still a huge part of my life. I got involved in Barre3 late last summer. After taking various barre classes and workouts throughout the city, an audition for Barre3 instructors came up. After audition, callbacks and a meeting, I was hired and began training. The training consisted of taking class, learning the basics, and postures and then studying anatomy and the class structure, cueing postures and platforms. After preparing for about three weeks, an anatomy exam and class test, I traveled to Portland, Oregon (where Barre3 was founded) and began an intensive training for five days. FlyBarre instructor Lisa Donmall-Reeve. Photo courtesy of Lisa Donmall-Reeve. “I started taking ballet in the UK when I was just about four years old. It was definitely more of a hobby at that age, but when we moved when I was seven years old, my mum put me in modern/jazz and tap, too. Those new styles had me hooked. When I started attending West End musicals, I just could not contain my excitement to become a dancer! I got my high school diploma in Dance/Drama and I then went on to a full time dance college in London, earning a degree in musical theatre performance. Since college I’ve performed as Velma Kelly in Chicago (West End), as Ulla in The Producers (West End) and in UK regional shows such as Crazy for You and 42nd Street. I currently work as a Flybarre instructor at Flywheel Sports. I have been an instructor for almost 2 years and I absolutely love the technique which features low weight/high repetition exercises to strengthen and lengthen your body. I was introduced to Flybarre by a fellow dancer who is also a Flybarre instructor. I took her class, loved it, auditioned and began the six-week training. You have two practice classes in which you are evaluated, and I passed and started teaching in March of 2013. Shauna Hoskin, Crunch Fitness instructor. Photo courtesy of Shauna Hoskin. “I grew up dancing at a local competition studio. As I got older and more serious about dance, I bolstered my training by adding strict ballet classes and Pilates to my schedule. However, it wasn’t until I moved to NYC at 19 years of age, to train at the prestigious Ailey School, that I had professional level dance training. I consider my specialty to be musical theater (I’m a showgirl!). My love is for classic jazz and tap. I feel most at home while fan-kicking in my highest character heels. When it comes to tipping and beveling, I’m the cream of the crop. 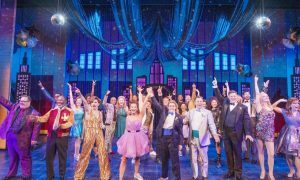 My favorite credits include performing on Broadway in the hit musical The Producers, with the famous Bluebell line at the Lido in Paris, France, and in concert with Turkish pop star Tarkan in Baku, Azerbaijan. I am lucky to teach a wide variety of classes around New York City. My Barre Assets class which combines Barre, Pilates and dance is one of my most popular classes. Mid-way through class we break for an arm routine with light weights which I choreograph monthly to a current pop hit. I also teach a fun, high energy dance cardio class. It’s a blast. You’ll leave this class dripping in sweat, but you are having so much fun, you forget it’s exercise. Pound is another popular dance-based format that I teach. We use weighted drum sticks for a full body cardio jam session. I also teach Jillian Michaels Body Shred, Surfset, Yoga, and Pilates. I teach about 15 classes, and see a dozen individual clients each week. When I began working on my Master’s Degree in Nutrition I needed a job that would be more consistent and involve less traveling than my performing career. I had several former colleagues who had started working in fitness to supplement their income. I had seen it have a positive impact on their lives so I decided to try it for myself. I have only been teaching for a year. The rewards and positive feedback have far exceeded my expectations. My only regret is not having started sooner! My training was very brief. I had to draw from the extensive knowledge of movement, posture and alignment I developed as part of my dance training. In addition to teaching classes, I became a certified personal trainer. The education enabled me to design class formats and develop workouts to suit the specific needs of my private clients. At every step in my training, I was able to pull valuable tidbits from my dance and performance background. Fitness has proved to be the perfect culmination of all my skills. Amanda Kloots, Body by Simone fitness instructor. Photo courtesy of Amanda Kloots. “My dance training growing up was mostly ballet. I trained at a pre-professional ballet school in Ohio. During the summer I would take modern and jazz classes, too. Now I specialize in musical theater dance. My favorite credits are Bullets Over Broadway on Broadway and The Producers at the Hollywood Bowl. 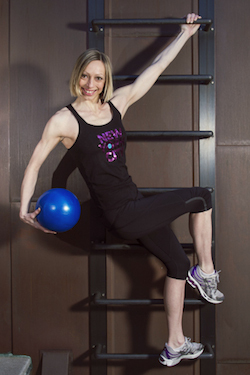 I am an instructor at Body By Simone, a boutique fitness studio in NYC. My fitness class is based on a dancer’s body so it’s very much like a dance class. I teach dance cardio, full body toning classes and a trampoline class. I became involved with Body By Simone because my best friend was working there and got me to audition. I’ve worked there for nearly three years. The training consisted of taking a lot of class and then several hours training privately with Simone, the owner. To learn more about each of these dance inspired fitness techniques, click on the links below.